When Mendocino County is in 'Fire Season' - Burn permits are required by: Air Quality, CalFire, and local fire agencies. Burn hours are 9:00 a.m. to 12:00 p.m. only on permissive burn days. When Mendocino County is in 'Winter Burning' season. Burn permits are required by: Air Quality, CalFire, and local fire agencies. Burn hours are 9:00 a.m. to 3:00 p.m. only on permissive burn days. Burn Suspension go in effect during certain times of the year, when fire danger is high. When Mendocino County is in 'Burn Ban or Burn Suspension' - All open burning permits are SUSPENDED. Campfires may be permitted by CAL FIRE. The California Department of Forestry - State Responsibilty Area (SRA), and Fire Protection - Local Responsibilty Area (LRA), and/or the Air Quality Management District require a Burn Permit for all 'open outdoor burning' during 'Fire Season' on lands under their jurisdiction. All residential and open outdoor burning require a burn permit and are allowed only on permissive burn days. Burn responsibly and do not cause a smoke nuisance for your neighbors. Manage burns to reduce excessive smoke by keeping material dry and burning hot with visible flames. Never allow your burn piles to smolder overnight. Avoid burning when high pressure is forming and a visible inversion is evident. Cooler temperatures and rainfall alone do not prevent fires from escaping control. Landowners are responsible for safely burning outdoors and maintaining control at all times. For tips on safe burning visit the CAL FIRE website at www.fire.ca.gov or check with your local fire agency. Always call the burn line for BURN DAY status. Call 463-4391. Outside of Ukiah you may call toll free (800)-992-5441 and enter 4391 at the prompt. Please be aware of the 'Burn Ban' beginning approximately July 1 of each year and typically extends through the end of the 'Fire Season'. All burn permits issued for burning are SUSPENDED. Please do not burn. Cal Fire and local fire agency burn permits are subject to temporary or permanent suspension due to critical fire weather conditions. 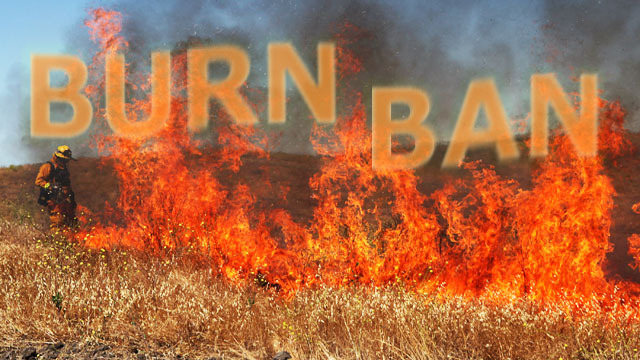 Therefore, be aware of the countywide 'Burn Ban' of each year that may extend through the end of the declared fire season. The 'Winter Burning' season is declared by the California Department of Forestry and Fire Protection, and runs from about November through April 30 of each year. The Local Fire Protection or the Air Quality Management District require a Burn Permit for all 'open outdoor burning' during the 'Winter Burning' season on lands under their jurisdiction. Burn permits are required year round. Open outdoor burning is only allowed on permissive burn days set by the Air Resources Board. Only vegetative matter may be burned. The vegetation must have grown on the property. Burn barrels cannot be used in Mendocino County. Burning related to property development requires a permit from the Air District. Always call the burn information line before burning at 463-4391. If you have any doubts about your need for a permit, call the District Office at (707) 463-4354. All non- residential burning requires a permit. All burns must be attended by a responsible adult. Large burns require a Smoke Management Plan. Piled Biomass Calculator (exit site). 2. 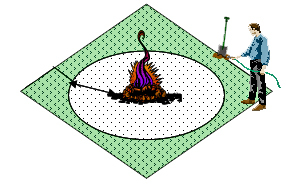 Materials must be arranged to promote rapid combustion with minimum smoke production. a. Trees and branches over 6 inches in diameter - 60 days. b. Prunings, brush and branches less than 6 inches in diameter - 15 days. 4. Aerate leaves to dry them prior to burning. DO NOT BURN WET LEAVES! 5. Burn piles are to be ignited as rapidly as possible to avoid smoke nuisance. If your smoke affects your neighbor, you can be held liable. 6. All vegetation must be burned on the property where it was grown. Burn barrels are not allowed for burning waste, including vegetation, at residences. 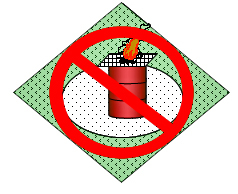 No Burn Barrels - Title 17 of the California Code of Regulations Section 93113. Title 17. 1. Minimum 10-foot clearance from all flammable material. 2. Adult in attendance with shovel until fire is Dead Out. 3. Water supply at burning site. 4. For the best possible burn, dry vegetative matter should be burned completely between the hours of 9:00 am and 3:00 pm in any single Burn Day. Burning of any milled lumber, paper, cardboard or other materials is illegal and can result in fines and possible legal actions. The State Air Resources Board, however the local Air District and Fire Agencies can suspend burning based on local conditions. Some major holidays are always designated no burn days. What is an inversion and what what does it have to do with open burning? Inversions are the result of poor air circulation. Mendocino County has significant inversions on a regular basis. 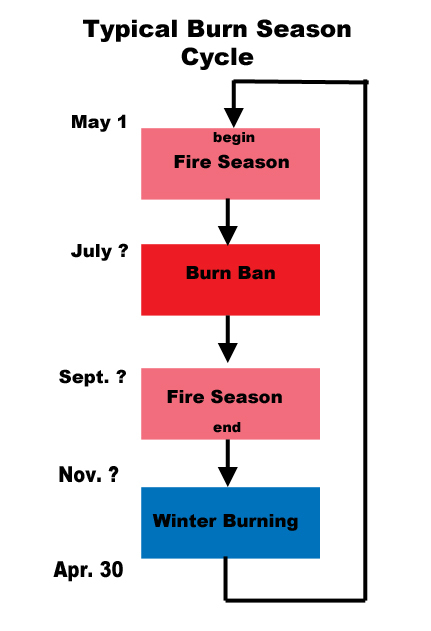 Are all burn permits the same? No. All residential burn permits for small burns, if issued by a delegated fire agency, are the same as the Air Quality District, however they may have special conditions for your local area. Agricultural permits are issued by the Air Quality District and may also require a Fire Agency permit. If you are planning a non-residential burn, you should contact the Air Quality District.